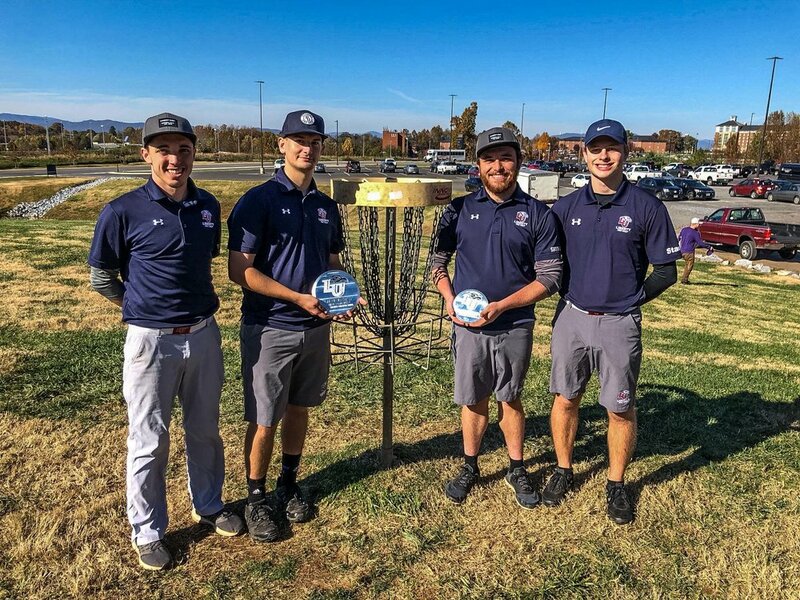 It was Liberty's first time competing in the event, held on three courses at the International Disc Golf Center, which has also hosted the Professional Disc Golf Association's (PDGA) National Championships. The Flames sandwiched rounds of 54 and 62 around a doubles total of 352 for an accumulative score of 468 to pull away from runner-up Clemson (483) as well as East Tennessee State (third, 485), North Carolina State, and Georgia Southern (tied for fourth, 488). "We had all three hot rounds and had three of the top four individual scores to win by 15 strokes," Flames Head Coach Steve Bowman said. "Everybody was playing great." Individually, senior Hunter Thomas carded an 82 to earn singles medalist honors followed closely by sophomore Trevor Staub (third, 85), and senior Ryan Shumate (fourth, 86). "That was incredible," Bowman said. "It was good to have that competition from guys we know we are going to see again at (National Collegiate Disc Golf) Nationals in April." Other teams in the field included UNC Charlotte (sixth, 497), Mississippi State (seventh, 498), Georgia (eighth, 500), Alabama (ninth, 506), and South Carolina (10th, 507). The tournament offered one national bid at the Division I (championship flight) and two at the Division II (first flight) levels. This Saturday and Sunday, Liberty will host its seventh annual Flamethrower Invitational at its 20-hole courses near Hydaway Outdoor Recreation Center and on East Campus with two Division I and three Division III national bids at stake. The Flames have won four of the previous four championship flights. Competition will start with doubles play at the Hydaway course Saturday following a 9 a.m. players meeting and will continue with singles at around 1 p.m. On Sunday, the tournament will conclude on the East Campus course with doubles in the morning and a final round of nine holes for the top eight singles players at around noon.